Home / Why do Business with HSL? When we are asked to solve a problem for a client, we look to the basics of what their business needs are and then build the solution that fits. Creating more complicated technology for the sake of adding the latest technology is not our our focus. We represent a large number of product lines, so our experts can help select the solution that provides the best value to your business at the best return of investment. We want to come to understand the nature of your company and help you use the right technology to grow. So, we would like to develop a mutually beneficial, long term relationship with you as your IT provider. Why Should You Trust Your Business with Us? We have been around since 1984 – but you want to know…. Freedom of Choice – choose pay as you need us (Break/fix) or a monthly unlimited support plan (MSP) – Full time support at a part time price! You might be saying – but “everyone” says they are the best. So the best way to convince you is to try us out – free, no risk for you. 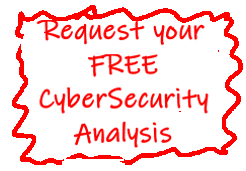 Request your free cyber security review by clicking below.